Hear how First Bank replaced all its branch MPLS connections with low-cost broadband by using SD-WAN technology from our sponsor Silver Peak on the latest episode of Tech Bytes. Oracle Cloud Infrastructure is slowly working its way towards being feature competitive with the Big 3 – AWS, Azure, and GCP. How are they doing that? By building out robust cloud infrastructure aimed at the typical enterprise. The Packet Pushers’ Tech Bytes is a short, sponsored interview. Our sponsor is Silver Peak, and today’s guest is swyMed, which makes a telemedicine backpack so first responders can videoconference with doctors and nurses from anywhere in the field. Silver Peak’s SD-WAN mini-appliance helps enable connectivity and ensure a persistent, high-quality connection. 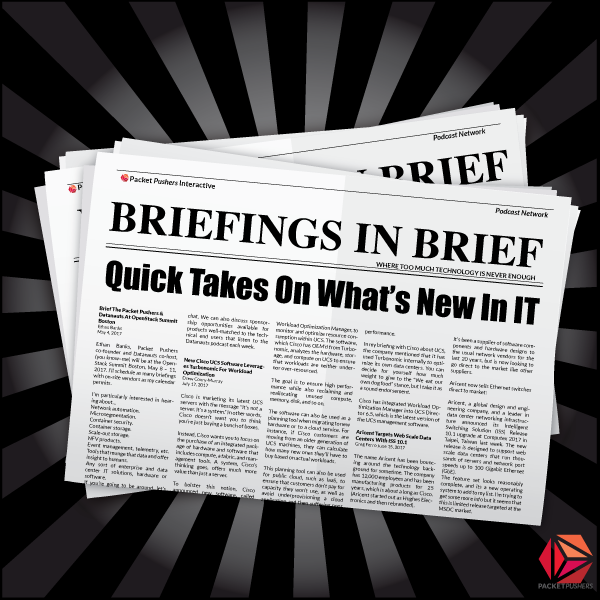 In this briefing, Meta Networks discussed their new partnership with Talari. Talari is an SD-WAN provider for enterprises. Meta is providing remote access. Therefore, what you’ve got with the Talari/Meta partnership is a full-featured WAN solution. NanoVMs makes software to help you create and deploy unikernels. In this briefing, CEO Ian Eyberg discussed with Ethan Banks the state of the unikernel ecosystem and how NanoVMs fits into things. Redhat Ansible talking about the future of Ansible, making it biggerer and betterer. Analytics for the real world WAN using agents to provide deeper visibility. Also Campus LANs and Wireless so you can build QOE dashboard. Arrcus is a startup that’s built a modern network operating system for the disaggregated networking market. They are running on $15M of Series A funding, and as of 16-July-2018, they have emerged from stealth. In this briefing, Arrcus shared some of the details behind ArcOS, their core product offering. Ethan Banks attended a technical webinar held by Arista Networks talking about their recently announced 7170 series multi-function programmable network switches. In this webinar, Arista explained what the new 7170 switch line was all about. The central reason this switch line exists is programmability. Rubrik Alta 4.2 offers AWS native protection for EC2, VMware vCloud Director integration, Windows full volume protection, as well as AIX & Solaris support. We zoom in on the EC2 part of the announcement. Juniper makes announcements around the upcoming MX Series 5G Universal Routing platform, including Si5 silicon, hardware acceleration for CUPS, and MX variants of the Universal Chassis. In this briefing, DriveScale announced Software Composable Infrastructure for Flash, which they claim is a market first. Flash storage is all about high bandwidth and low latency, and the latest NVMe flash drives have ferocious network-filling capability. If you think serving storage over Ethernet is a performance compromise, think again. VMware’s networking and cloud ambitions come into sharper focus with the introduction of NSX SD-WAN by VeloCloud. Anuta Networks will launch a SaaS version of its infrastructure orchestration software on June 1st. Ethan Banks does a five minute review of the enterprise-oriented D-Link DGS-1510-52 Ethernet switch. Jeff Gray, CEO at Gluware, chatted to the Packet Pushers about how they can automate any network, including the one you’ve already got. CEO Neal Roche at Apposite Technologies briefed Ethan Banks about WAN emulation and their new Netropy 100G appliance. Find out more about Apposite at https://apposite-tech.com. Anuta Networks launches its ATOM platform for multi-vendor network infrastructure automation and orchestration.